The new MacBook Pro's are undeniably amazing. But if you rely on USB 3.0 devices for work, the lack of these essential ports can be a nightmare. This HyperDrive USB-C Hub with 4K HDMI Support lets you use all of your go-to USB devices on the new MacBook Pro, and it's available for 25% off at just $44.99. Featuring an HDMI port, two USB 3.0 ports, and an extra USB Type-C port all on a single and portable bar, the HyperDrive allows you to drastically expand the functionality of your new computer in order to accommodate syncing cables, camera cords, flash drives, microSD cards, and much more. You'll even be able to play 4K HDMI video on external monitors and charge your laptop with pass-through charging. 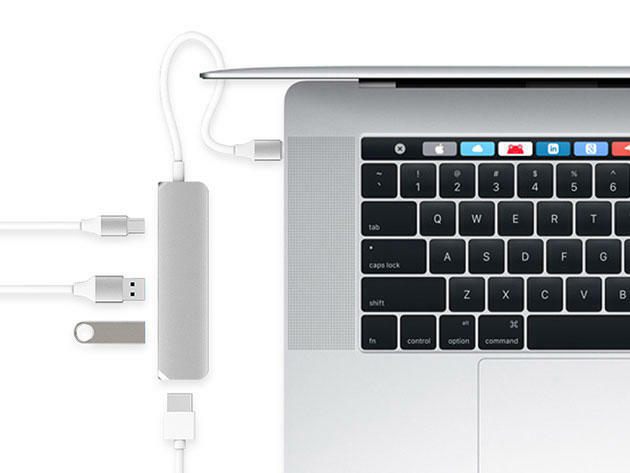 Don't be held back by the new MacBook Pro's limited port functionality. The HyperDrive USB-C Hub has you covered for just $44.99.